Cell phone boosters are a great way and most likely the only way you can improve your cell phone signal. Does your phone signal drop right off when you go into your house? Maybe your office is in the basement and you do not have good cell phone signal down there. If you live in a rural area you might get poor reception even outside. If you have a warehouse or large building that is constructed with a metal exterior then that will greatly decrease the signal as well. With cell phone boosters we install the antenna up high on the roof of your house or building where the signal is strongest. We use a Yagi antenna or a more directional antenna if you are far away from the cell tower or have a lot of trees. We use a special mapping system that tells us where your local cell phone towers are located. We then point and tweak the cell phone antenna to optimize the cell phone signal. 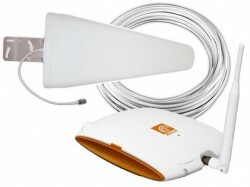 Inside you home or building we install an indoor booster and antenna. In many cases our customers have little or no reception on their cell phone. Once we install the cell phone booster our customers usually see their cell phone signal go up to 4-5 bars or full signal. The boosters also improve the signal on the Rogers rocket hub, the Bell turbo hub and the Telus wireless internet hub. We service the areas of Toronto, the GTA, Etobicoke, Thornhill, Vaughan, Richmondhill, Markham, Brampton, Mississauga, Ajax, Pickering, Whitby, Oshawa, Stouffville, Bowmanville, Port Hope, Cobourg, Port Perry, Uxbridge. The cell phone boosters are popular in rural areas or in cottage country country. Any areas in Northern Ontario, Kawartha Lakes and Rural Ontario or Canada where the Cell Phone reception is poor then a cell phone booster will help. This cell phone booster kit provides increased in-building voice and data coverage and superior reach into rural environments using a high-gain directional signal antenna which is aimed at the nearest network tower. The signal booster covers up to 6500 square feet and supports multiple users and all devices operating on (CEL) 800MHz & (PCS) 1900MHz networks. Compatible with all mobile phones and data transmitting devices operating on (CEL) 800MHz and (PCS) 1900MHz – iPhone, Samsung, Blackberry, etc.